It may seem like a battle of semantics. But that two-word phrase is very important to consider when your business decides to dive in to content creation. It’s easy to switch them around, putting the marketing before the content in an effort to gain readers, viewers, or listeners, and ultimately, customers. Unfortunately, this usually ends up having the opposite effect. Fortunately, the converse is also true. When you focus on the creation and quality of your content, you become far more effective at bringing interest back to your business. Keep in mind that things like SEO are important, but by creating great content first, the marketing is sure to follow! 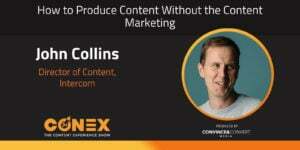 How to develop content, straight from the experts. How to set up an effective editorial calendar. How to approach repurposing content. Which city do you love better, San Francisco or Dublin? John was born in Dublin and has spent most of his adult life there, so he would have to say Dublin. San Francisco has always held a special place in his heart, though! If you could tell someone the best place to go get food in Dublin, and then the best place to go get food when you’re visiting in San Francisco, what is at the top of your list? John’s favorite Dublin restaurant is called Clover Alley, and his favorite San Francisco restaurant is a small neighborhood Chinese restaurant in the outer Sunset area! 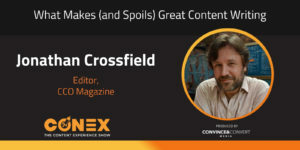 Randy Frisch: Welcome to ConEx I'm Randy Frisch, Anna is with me, and as always we don't want to waste your time so we're gonna tell you what to expect in this week's episode. And we had John Collins join us from Intercom. Anna as I told you, and I mentioned this embarrassingly, I'm like an Intercom fanboy. It's like, cool company, cool product, and John is super cool. Anna: Yeah, I know, I think if you had it your way, it would've been just Randy and John fanboying out over Intercom for about 35 minutes, but thankfully, that wasn't the case. Randy Frisch: Yeah, and he was in San Francisco and I was in San Francisco yesterday, we could've done that. But it is what it is and when you hear John talk you realize he's not normally in San Francisco. Cause he's got this awesome, Dublin-based accent going there. Anna: It is, yeah, it's very nice to listen to. But no, John was awesome. Honestly, I was starting to fangirl out over here. Obviously Intercom is amazing to begin with, but then to hear what John and his team have accomplished it's so my jam. I love it. It's about putting content first, quality content first, putting your audiences first and then maybe sprinkling in some SEO at the end. Which I know is not always people's preferred method, but I loved what they've been able to achieve with that approach. Randy Frisch: Yeah, absolutely. And if you're gonna listen to this podcast, and I encourage you to hear it all the way through, one other thing John gets to that I always troubles my team is, how do we take on these bigger projects? Right? I mean, we get stuck in the editorial calendar and we know we want to have "X" number of blog posts a week or different recaps that we send out. And we have all these other requirements from our company to create content for them, but then how do we take on projects? And they've done so with some really great books, and I think one of my favorite parts is that those are some of the assets that they feel most proud of. Those are the things that they get fan pictures from guys like me. Reading it on a beach, or something like that, as John said. Anna: Yeah, it's crazy how much content they're creating and not just how much content they're creating in terms of volume, but how much really excellent content they're creating. And they even talk about re-purposing content, I mean they are - they're doing it all, and they're doing so well. And they're seeing massive success with this. Randy Frisch: Yeah, the cool thing too, to me, about Intercom and their audience; they have a very fun audience to write for. They're writing for business owners, they're writing for businesses that are trying to grow from the start up space and, in fact, Intercom's been one of the sponsors of this podcast because they're trying to connect with the business owners who listen to this. The marketers who are trying to grow their businesses. If you haven't tried Intercom before, it's a great platform. We've used it here at [Uberflip 00:02:47]. It basically helps with business messaging. So, if you want to find the best leads that are coming to your site, and boost them to the top of your funnel, increasing efficiency in growing your business, that's where Intercom comes into play. The solution that we've used before is their messenger, it's called "Intercom Messenger" and it's a customizable - it's completely customizable, rather, to match your brand. So really feels aligned as people come onto your site, to get this ability to engage with visitors in this, interactively with content. Whole bunch of other functionalities built in to Intercom. They clean their chatbot, it qualifies and writes people to the best leads. Now all this said, that's not what we're gonna talk about today. I don't think he even wants - Anna, did we talk about their product? We really talked about how they connect with their audiences and that's why, to me, Intercom's such a cool company. Anna: It is, yeah, and if anybody wants to go check out some content while they listen to this episode it's Intercom-dot-com-slash-blog. That's a huge hub, but they also have a podcast. Again, they just have a ton of amazing content. And yeah, we didn't talk about their product once, but I think it becomes evidently clear just how they're helping to really help their customers without being salesmen. It's really amazing how they've approached content, but still manage to meet their goals. Randy Frisch: Absolutely. So, without us ruining the whole episode, why don't we roll it in. I believe this week was you introducing John. Anna: Hey John, thank you so much for joining us today, it's really great to have you here. John: Thank you for asking me to be on the show. Anna: Yes, so let's go ahead and get to know John a little bit. Would you mind telling everybody just a little bit about yourself? John: Okay. I'm John Collins, I am Director of Content at Intercom, which means I run the content team who produce our blog inside Intercom. We also put out our own podcast, which is also called "Inside Intercom" every Thursday. And we also do all our gated content, which are things like books, guides, starter kits, we also call them our "long reads" and at the moment we also handle social strategy for Intercom. So it's quite a broad church, and so we have quite a big team split between San Francisco and Dublin. There's actually 9 of us at the moment. And yeah, contents been a really successful for driving leads for business - sorry, driving leads for Intercom's business. And I think we've quite a strong reputation for content, cause I think we've generally focused on the quality of what we're creating and really trying to create something that we, as peers of our audience, would want to read ourselves. Anna: So that, I think, is really interesting; the approach that you've taken, because you guys have really developed a strong reputation for producing highly opinionated content. And I want to jump right into it because you created this fantastic post about why your actually dropping the term "content marketing." Can you talk to us a little bit about how you came to that? And why you actually dropped the term "content marketing"? 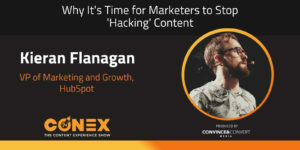 John: I think, really, content marketing in the last few years - 7 to 8 years ago - had great potential, people really felt it was gonna be an amazing tactic for businesses. But pretty rapidly it lowered diminishing returns and it seems like there's almost a bigger industry around content marketing than actually people who use content marketing to work in other sectors or to benefit their business in other sectors. And that's because, I think, it's become very playbook orientated. People are not ... They're worrying more about the marketing than the content, and in many ways it's not about content at all anymore. And I think our approach very much was, if we create something that people really want to read or listen to or watch, we don't have to do as much promotion. We don't have to do as much marketing, there's not almost this kind of slightly spammy connotation of fooling people to come to your side. I'll give one example I think of the way we think about in relation to, say, SEO; that we don't ... We're not driven by SEO, so obviously we will look at where opportunities lie in terms of key words, et-cetera. But we still will make sure that the article we're creating is something that we believe people in our target segments in our target markets will genuinely want to read. And then we apply SEO closer to the publication time than a lot of traditional content marketing organizations would do. And I think that means, then, when you do read the content, sometimes I think very SEO driven content can just ... It feels unsatisfying. It feels a bit like a McDonalds Happy Meal, cause you've kind of ... You've clicked through with such hope and then it's not quite what you're looking for. Or it's just not quite the depth of content you're expecting. And so, as I say, we very much think about content first, then marketing. I do think some people misunderstood me when I wrote that post and kind of felt it was almost a slightly naïve approach, and we were saying "If we build it, they will come." Absolutely not, my team engaged in all the things that we do to grow our audience and that any other team would do. But we did focus on the content first. Randy Frisch: First of all, I really like the piece John, and I've been down that road of writing a piece that people take a first glance at ... You and I, actually, both took a stab at content marketing. Myself, more recently, and sometimes we have to explain what we mean there. I like your focus on the importance of what we're writing versus just the mentality that, "Okay it's time for the next post," or, "How are we gonna bring in enough leads with this next aspect?" I guess the part that where you and I took different approaches was; I actually felt that people aren't focusing enough on the marketing, right? Now, the part that I want to dig closer on you on, though, is what are some of the things that people can do to put content quality first? And I'm curious as you talk about that, and talk about your ... the history of how you got here. I mean, you came from more traditional editor role. From journalism space, where quality was key. I mean, if you didn't have quality people aren't gonna follow. John: Yeah, I mean I think for us it's very ... we're taking a lot of stuff from, say, the publishing industry or newspaper industry. Just traditional industries where they have things like editorial calendars. They have approval sign-off processes, they have different types of editing they do at different stages. And these are all things that just, sort of, second nature to me and my team. I don't think they're hugely revolutionary in many ways. I think what is different is that we are applying them to content marketing effectively. And I think that's ... A very simple editorial processes really make all the difference. People often say they want to do content marketing, [inaudible 00:10:16] so how you gonna do it? And they're like, "Well, we've got an intern," or, "Hey I'm gonna get some freelancers." And it's like, you're saying this is a really core tactic and it's really gonna help grow your business, like what other core tactic that's really gonna help your business would you ask people to write posts that weekend, or in their free time? When I joined Intercom, it really struck me, a lot of people are like a desk writer or co-founder was running the content program at that stage and even at that stage had really shown that the power of content and the Inside Intercom blog to the business. People would say, "Yeah, I love this stuff that Intercom did, but how do they find the time to do it?" And it's like, well find the time in the same place they find to do coding or to design the product or to do any of the other things to do. If you're gonna do content as part of your marketing, I think you really just have to say, "Right, we're gonna resource this and we're gonna invest in it," and for us, it made sense after I'd come in and after an initial period I'd shown that a lot of the skills and processes that I'd learned in the editorial world could actually help us scale the model we have. Randy Frisch: So speaking to that scale, your team has obviously grown from - as you put it - the founder running content to, if I remember right, you've got 8 people working in the content team alone. Is that correct? Can you give us a break down of what that looks like, to handle that calendar? John: My team is actually split between San Francisco and Dublin. Our two major offices are in San Francisco and Dublin. And the reason for that is, actually, our whole model is based around the subject matter experts. You will rarely enough see my by-line on the Inside Intercom blog, or any of my team. If you do, we're generally writing about marketing, or things that we're subject matter experts on. No one really cares what I think about product management or no one really cares what I think about customer support. But they do care about our Director of Customer Support, what he's learned on the job, or even some of our customer support reps. So our job is very much to work with those people and try and figure out how we can get them on to the blog. Some of the people we work with are amazing writers, we literally do a live copy edit. Other people are not good writers, but you know what? They have experience and they can talk you through what they've done, so we might interview them, transcribe them and write them up as post. Some people we ghost write with. We are constantly thinking about ways we can get more ideas out of people around the company and actually get them on the blog. So I mean, that's kind of like why we have a calendar. I know some people say content marketing should never have a calendar really, that you should be driven by other things, but we really have to manage the flow of ideas and articles we have were published in every Business Day. So, we do five posts a week and we have to make sure, obviously, we have posts in different stage of production at each stage of production so that we have a good flow. We also have our podcast, which we're producing every week and turning that into a blog post as well. I'm a very big believer, content is not cheap to create, but I'm a very big believer in trying to ... What content you do create, to then try and re-purpose it in different mediums. Again, though, I think sometimes content marketers can take that way, way too far. You see people really flogging the same idea 'til people are kinda sick of it. But yeah, that's kinda broadly how we're organized between Dublin and San Francisco. We've started introducing vertical specialists, so we have people on the team who look at particular area - like sales and marketing, was the first one introduced - Intercom housed a product. That plays in sales and marketing space, so we have a specialist who really, really gets to know that vertical. And really understands who the influencers are, what the big conferences are, what are the big issues for sales and marketing people? What are their pain points? And then we have someone, sort of horizontal specialists as well. Adam [Reisman 00:14:31] who you'll often hear in our podcast, he is the podcast producer, effectively, and he'll then work with other people on the team when they need to host a podcast or ... One of our execs, or whoever needs to come on the podcast. Anna: Nice. This is, by the way, an amazing team structure, I love how you have both specialists and generalists and they all come together to create all of this magic that you guys create every single day. I definitely want to get more into this, but before we do, let's take a quick break to hear from our sponsors and then when we come back we're gonna talk more to John about his team and how they create such amazing content and how it all comes together. Hey everybody, welcome back we are talking with John from Intercom. Now John, before the break, we were talking about your amazing team structure and this fabulous mix of content generalists and editors and then also, subject matter experts and people who are very specialized within different verticals. So you have a lot of people creating extremely high quality content. Now, I know at the beginning of the podcast we kinda talked about how leading with search is definitely not the best way to go. So how do you and your team actually plan content? And how do you determine what gets made, just in case anybody out there is leading with search right now and is looking for a different way. John: So I think very much we have a quarterly planning process and we will literally get down to how many posts we're gonna create in each category over the course of the quarter. We also overlay that with, I think, different types of posts. So, for instance, yes we're part of marketing, we're totally focused on getting people to be aware of Intercom and then ultimately to consider Intercom for their problems, but we also ... Our blog is a really, really powerful recruitment tool. So we have to think about how we're gonna help the company grow over the course of the quarter as well. So we overlay recruitment type articles or articles that we think will showcase Intercom as a place to work. But in terms of the actual categories that we will pay attention to over the quarter, it's like any other part of marketing. We get the company goals for the quarter, we then figure out how that's gonna be, how we're gonna implement that on the blog. So, for instance, if we've got a new product or a new solution coming out, how're we gonna actually seed our leadership in that space? How are we gonna support the actual launch? How're we gonna support the ongoing sale of that product? So the team will ... While the actual week to week is down to Davin and Fiona, who edit the blog between them in terms of what gets published each week - I don't get as involved with that. But the actual quarterly ... There's gonna be "X" amount of sales and marketing posts, there's gonna be "X" amount of customer support posts, that's really how we pull it all together on a quarterly basis. Randy Frisch: So, quick question for you John, because everything you're saying makes perfect sense. There's a lot of requirements that come into a content team to support the entire organization and I like how you tie that editorial calendar to the goals and priorities in that quarter. But your team also takes on some very big projects. I've checked some of them, I'm an Intercom fanboy on the side. Not just for this podcast, I'm a follower. You guys have created hard cover books, even, to help entrepreneurs get off to the races. So my question is, how do you know what is going to be a priority on those ahead of time? And how do you fit that into the editorial calendar? Cause I think that's the part that a lot of us, we push off those projects because we're stuck on the day-to-day as you described. John: Yeah, well I suppose we've actually done seven books now and they kinda fall into two categories; the biggest category would be books like 'Intercom on Customer Engagement', 'Intercom on Customer Support'. We do those books because we actually have products in that space, or that solve that problem that people are trying to address. And I think, we also have quite a large product education team who are creating content to help people get more out of Intercom, so people are like, "Well, if they're doing that, what's Intercom on Customer Engagement about?" And we say, "Actually, it's about seeing the world through the lens of Intercom, so if you read that book, it'll be all about how you can use messaging to drive much deeper engagement with your customers." But you know what? If you use one of our competitors products, you'll still get value out of that book. It's not so laser focused on Intercom, or the actual UI, or the actual settings you might use. But we will talk about how you would effectively target customers, and so, it's like what filters you would apply, et-cetera. So it's, as I say, very much sees the world through the lens of Intercom and our products. Other kind of books we do, though, and this is - I think - why I really enjoy working at Intercom. And it's kind of, for both myself and my team it's pretty rewarding place to work, is that sometimes we get that permission to go, "You know what, this is not necessarily tied to a goal or ... We just know this is a good thing to do and we think you should go and do it." So, for instance, 'Intercom on Starting Up', we had written so much stuff in the early stages of the company, about sharing our own startup journey and what people like Dez and Owen, our CEO, one of his other co-founders, had learned along the way. And those posts ... Some of them were three, four, five years old, but lessons on how to price a product are still pretty valid. So what we did was we really took five or six best posts we'd written on pricing, boiled that maybe, four or five thousand words down to the 1000 words of the really best advice and wrapped around of it some sort of current commentary, some pictures from the early days of Intercom, various bits and pieces like that. Put it in a hardback book and it's been a phenomenal success for us on a branding basis. But it's definitely not like a core 'how many products are we gonna sell? 'on the back of that. Anna: That's actually really fascinating. So you brought up content re-purposing earlier in the conversation, and then again you just talked about it. I think that's really actually something that most content creators and most content strategists really don't do enough of. Is really looking at this existing set of content that they've created, maybe it's driving towards a lot of goals that they have. How do you really instill and make sure you're constantly re-purposing content? Cause this, I feel, is something people really struggle with. John: Yeah, and I think a lot of the problem is sometimes people just think about, "Okay I've got this blog post," or "I've got a really long-read blog post and I'm just gonna chunk that up into smaller pieces that I might [inaudible 00:22:00] Facebook posts" or, "I'm gonna chunk it up into ... I'll get so many tweets out of it." They just think of the same content in a different medium. And I think, actually, what you really need to do is think about how's it gonna work in that different medium? And how are you gonna make is suit that different medium? Just being little bit more creative about how to make it work harder. I used to say to people when we were working on Intercom and starting up, it's kind of like in many ways we're end of life'ing a lot of these blog posts. They're still doing well for us, they still get a lot of search traffic, but if we didn't put them into the book last year they would have started to get dated. And it's like, now's the time to really think about how can we use this creatively in another medium? Randy Frisch: Plus I have a lot of 'um's' and 'right's' and things like that. I'm terrible. John: Exactly, exactly. So, we do re-work it so that it reads as a blog post and we put in images and pull quotes and all the other things that we put into a normal blog post. But it's really quite interesting, sometimes that certain episodes will do absolutely ... almost better as a blog post than they will as a podcasts. To me it just goes down to, people want a choice of how to consume stuff. Some people want to listen to stuff, some people want to read stuff, some people want to watch stuff. And so, just think about how you're serving those different needs of those different audiences who will be in different places. I have to say, when we launched our podcasts - coming up for three years ago - I was not a huge podcast listener, so I just wasn't as close to potential. But I've been amazed at the audiences for podcasts. And, of course, there's so many good podcasts coming out now in the last couple years, both for work and for personal stuff. Anna: Yeah and starting up a podcast, actually, is far easier than most people think. We actually have, I believe right before your episode airs, we have someone come on, [Joel Comm 00:24:16], and talk about how to spin up a podcast. But yeah, it's a great way to reach people, and again, something that most content people don't necessarily gravitate towards, I think 'cause it's not the written content. But it's just as valuable, when it comes to content planning. Randy Frisch: And I think you're setting un-reasonable expectations though, for those who listen to that other podcast. Not all of us get three million listeners in their first nine months. Anna: I didn't say it was easier to have a blast off, just [inaudible 00:24:44]. Randy Frisch: That was a wild episode, yeah, absolutely. Anna: To start a podcast is lot less than what people think. Clarification. Randy Frisch: To start, true, true. John: Everyone assumed [inaudible 00:24:58] want to do content it was gonna have to be a blog. Four years ago, when I joined Intercom, everyone was like, "oh yeah, we're gonna do a blog." And actually, if you're doing content now, there's so many options of : do a podcast, why don't you do a YouTube series? Or whatever. But I think, actually, obviously a blog has great advantage that it's your property and it's much easier to everyone to convert visitors. But if you're at that early stage and you're competing for attention and you're just trying to get eyeballs, I'm not convinced I'd start a blog if I joined a 50-person start up now. Randy Frisch: What would you start with? John: I definitely think the podcast would be really interesting. I think, depending on the segment you're going after ... I think LinkedIn has some great possibilities to attract an audience, particularly a more enterprise audience, or a more sales-focused audience. It would really depend on what the product was, but I certainly would think long and hard before I spinned up a wordpress instance. Randy Frisch: Well John, maybe you'll give us one more tidbit before we go to some personal questions, here, which is; in the four years you've been there, we've talked about all these different formats, what's been the asset that's given the most back to Intercom in your mind? John: I would say probably the 'On Starting Up' book. Felt like the most personal expression of anything we've put out there. And as I say, it's not necessarily as tied to being about any of our specific products or solutions. But it just really spoke to an audience, particularly an audience that Intercom was synonymous with in the early days. And I think people were just ... The feedback was amazing. We got people tweeting pictures of themselves reading it on the beach. There was a real, just like, wow. John: It's really well produced and they're really just sharing so much information that's useful to me. That feels good, you know? I left journalism, I worked in newspapers and things, worked on news desks and I certainly had some colleagues who felt like I was selling out a little bit. You're going to work for a corporation? Even though it was a small start up at the time. But, actually, it's where you feel like you're actually helping people do their job better, or be better themselves that I find is the buzz that I think a lot of people would say what journalists would get from working on newspapers or in news room or wherever it might be. Randy Frisch: I think I give credit to what you guys have done. I think you've very much humanized the Intercom brand, which is a really tough thing to do. And to your point, I mean, a lot of times when we see brands create a book they're not able to get away with making the author the actual brand, which I commend you guys on doing and succeeding with. 'Cause usually you have to put that founder behind the book, or someone who's the thought leader out there. But these books are by Intercom, but they're still relatable to us as the people who interact with your brand on a day-to-day. Now that we've gotten to know the Intercom brand, we're gonna take a quick minute, if you have time though John, we're gonna keep you around, we're gonna get to know you. So, be back after this on ConEx. Alright John, so we've got only a couple minutes left here, and we're really gonna hit you with some hard questions here. Which is, you said you have a team in San Francisco, you said you have a team in Dublin, now I'm trying to find out which city do you now love better? John: I'm born, not raised, but born in Dublin. Have lived the largest part of my adult in Dublin, so I would actually be - I'm in San Francisco right now talking to you - but I don't think they'd allow me back into the country if I didn't say Dublin. Randy Frisch: That's fair, that's fair. John: San Francisco, even pre-Intercom, always had a place in my heart. I've been visiting here on and off for ... since, actually, the 90s - I'm aging myself there. Yeah, I love San Francisco as well. It's got its problems, just like every big city, and every city that's gone through a lot of growth, but I do love it. Randy Frisch: Nice. So what is your ... Like if you could tell someone the best place to go get food in Dublin, and then the best place to go get food when you're visiting in San Francisco. What is top of your list? John: Well the top of my list in Dublin at the moment is, literally the night before I left I had an amazing meal in a new restaurant called "Clover Alley" right in the center of the city. An amazing tasting menu, it was a little bit on the expensive side, but yeah. Andy McFadden is this young Irish chef that just come back from London and established a really great spot in Dublin. So definitely recommend "Clover Alley". I love when I come to San Francisco trying to get some Asian food. Asian food in Dublin is not great. There are a couple [inaudible 00:30:02] which I think is way out in outer Sunset or somewhere. Couple of my team have brought me there once or twice, it's this amazing ... it's Chinese food from the province besides Sichuan, I'm not an expert, but it is next level. Unfortunately, the sound track - I think it's a Taylor Swift album - I thought the guys were joking when they said, "Yeah, they just play the same Taylor Swift album over and over again." Randy Frisch: Poor waiters and waitresses at that establishment, wow. Anna: Isn't it weird that I kinda want to go now? Just to experience it? So what is the experience like? Are you just like, "Huh, yeah, alright, that's the same Taylor Swift album again and again." John: Yeah, it's just kinda almost like a neighborhood restaurant and it's ... The music isn't loud enough, it takes you awhile to realize, "oh, this is on a loop." Randy Frisch: Well listen, you're clearly staying long enough to eat, so the food must be good enough to realize it's on loop, so there's a good thing in there somewhere. Right? Anyway, John this has been really educating, really informing. As I said at one point in there, I'm an Intercom fanboy, so this has also been a highlight episode for me. Really thank everyone for listening to John and his story at Intercom. 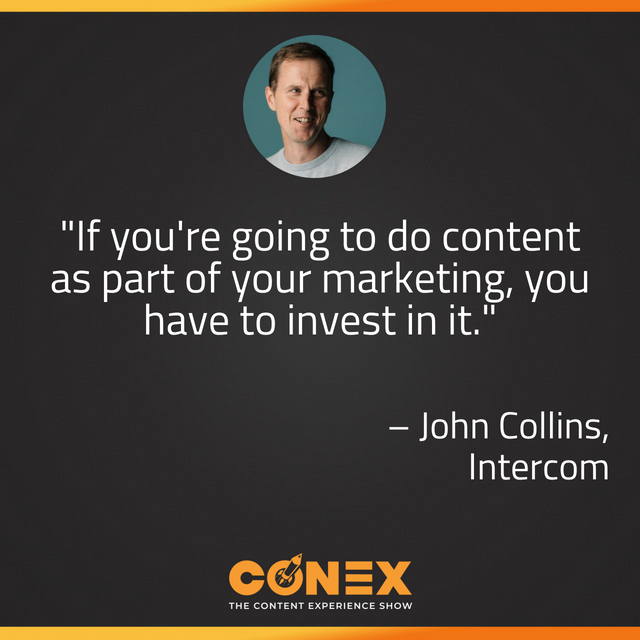 If you want to learn more, John where should people go to check out some Intercom content? John: Well just Intercom-dot-com-slash-blog, find out everything you need to know from there. We put everything through the blog. Follow us on Twitter we're sharing our content all the time. Randy Frisch: There you go. 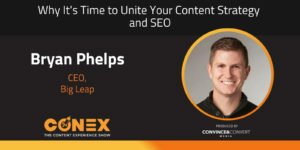 Thanks so much John, on behalf of Anna Hrach at Convince and Convert, I'm Randy Frisch at Uberflip and this has been the Content Experience Show.